Defining your ERP solution decision criteria – An internal evaluation of your company’s needs is a critical step in finding a long term ERP solution that fits. Selecting your internal project team – Incorporate this outline of common roles and duties that each team member will be responsible for. Recognizing common risks and pitfalls– Learn how to avoid common mistakes in selecting and implementing an ERP Solution. Valuable questions to qualify both ERP vendors and solutions – Determine your ERP demo requirements and outline questions to ask prospective vendors. 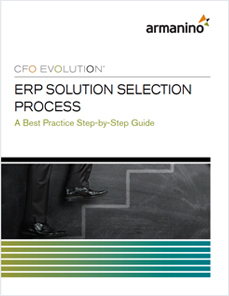 Start your ERP search out right with this comprehensive Step-by-Step ERP Selection Guide. To obtain a free copy of this white paper, fill out the form below. A download link will be emailed to you after submission. This white paper was written by Tim Hourigan, enterprise resource planning (ERP) consultant with 20+ years of sales and implementation experience. He offers insight for staying focused on the big picture as you prepare your organization for long-term success throughout the complex ERP implementation process.